Let The Med Spa help you turn back the signs of time! Treatments for sun damaged skin, age spots, fine lines, wrinkles and underlying vascular conditions like Rosacea and small facial veins call Tlangectasia. Difficult skin blemishes, acne and even port wine stain can safely and effectively be treated. We at The Med Spa have been changing people’s lives. There is nothing better than having someone comment that you look great! Let The Med Spa make this happen for you. Collagen is the substance in our bodies that keeps our skin looking youthful and smooth. As we age, our bodies naturally produce less and less collagen, resulting in the appearance of fine lines and wrinkles. 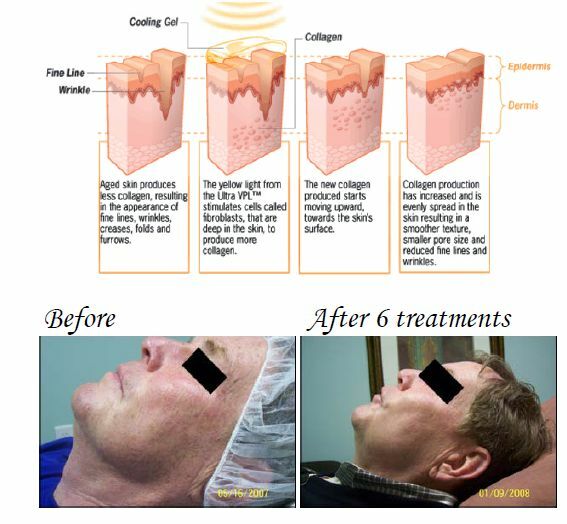 The VPL laser treatments stimulate cells in the body called fibroblasts to produce more collagen. The new collagen moves outwards to the skin’s surface resulting in a smoother texture, smaller pore size and reduced fine lines and wrinkles. Our new protocol for fine lines includes two VPL laser treatments done 2 weeks apart resulting in a 140% increase in collagen production. The perfect treatment combination for anti aging is using VPL treatments, Osmosis skin care, Medi – Facials and Facial Infusions. Come in for a FREE consultation to educate and design a specialized treatment plan for you. By Ben Johnson, MD Osmosis has a different focus than most skin care lines; we believe in creating a partnership with the skin. This partnership includes utilizing ingredients that the skin recognizes, maintaining the epidermal barrier while focusing most of our attention on the dermis, virtually eliminating inflammation during repair and feeding the skin through increasing blood flow. The combination of these strategies in conjunction with our unique ability to penetrate the skin without harming it make this line the best in the world at restoring skin health. *Osmosis Anti-Aging Facial Infusion– Creates deep firming, significant rejuvenation and remodeling of damaged skin without acids or trauma resulting in beautifully radiant skin. This is a powerful Vitamin A non-acid peel treatment that does not traumatize the skin and increases collagen and elastin formation. This wonder treatment effectively addresses the visible signs of aging, sun damaged skin, and hyper pigmentated skin. The treatment will conclude with a restorative mask infused with powerful antioxidants prepared especially for your skin type. This is truly a transformative treatment. *Osmosis Anti-Aging Medifacial– Prevent the signs of aging with Osmosis medical grade facials, the most advanced skincare products on the market. This facial includes a deep cleansing, warm towels with an enzyme firming and exfoliating mask, facial massage, hydrating herb mask, and antioxidant serums for fighting time and returning it to a more youthful state! Linda Murray answers your questions about Laser hair removal .